You can get 100 massages and never see your posture change. That's fine for most people because they're not looking to correct their imbalances. They don't realize how crooked they are or how their poor posture is hurting them. 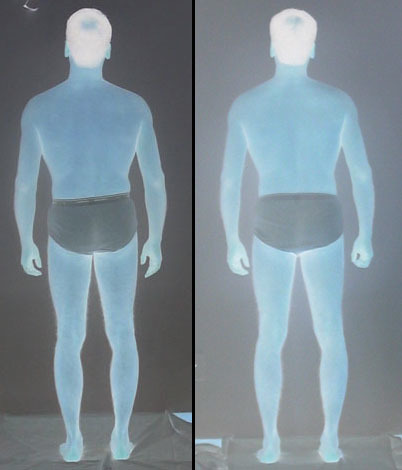 But if you do understand how important your alignment is, then Rolf Integration is for you, because this technique has been proven to make bodies straighter. Not only does this stuff work, it also feels great. The most common feedback I get is, "I've heard Rolf Integration was painful, but your work doesn't hurt at all". You will feel straighter and lighter after your first session, and you'll never lose the benefits. 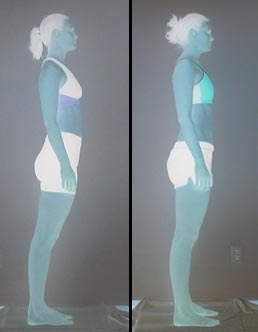 Uneven hips places huge strains on the lower back, knees and hip joints. From good posture to great. 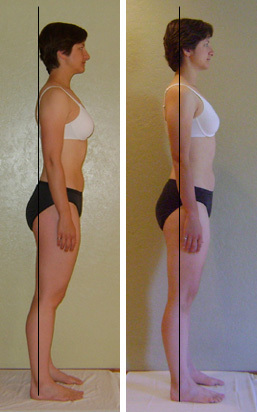 Imbalanced posture leaning forward or back places great strain on the spine. Here's where you get to come, relax, and let me do all of the work. You'll enjoy releasing tension from your body and having some time set aside in your busy schedule that's just for you. And when you get up from the table, you'll feel refreshed and have a whole new sense of space in your body. You'll also gain a fresh understanding of how your body has been dealing with the constant pressure of gravity, and how you can now use that force to your advantage. Rolf Integration helps people achieve changes that they would not otherwise be able to attain without a helping hand. Don't wait for your body to fall apart (anymore than it already is). The longer you go without upgrading your posture, the more your shoulders hike up towards your ears and roll forward into your chest. The more your upper back rounds and your recurring pain increases. Yes you'll enjoy the work and it'll make you feel great today, but think more in terms of 10 years from now. Every bit of advantage you can get now, will dearly pay off later. 1. Schedule A Private Rolf Integration session today. 2. Schedule A Mixed Session to get the best results faster by combining Yoga Therapy in to the same session as Rolf Integration. I've had 2 ACL reconstructions, a bulging disc in my lower back, carpal tunnel, I have 7 anchors in my right shoulder and I have nerve issues in my foot. I truly truly am blessed that I found Christian. Let him help you with your body and your health. I was severely injured in a motor vehicle accident with chronic low back and neck pain I am a board certified Internal Medicine Doctor. The best single therapeutic thing that I did for myself, and I did lots of therapies, was come to yoga with Christian Leeby. The yoga is extraordinary, it's life changing and it actually allows you to heal yourself. I couldn't recommend him more highly. I was having horrible, horrible sciatica pain for months and I'd been pretty miserable And I have been sciatica free ever since so I can not say enough wonderful things about Christian. He's a great instructor and a great human being and I highly recommend him. I had a collision with a tree, and literally tore everything in my knee there is to tear, acl, pcl, tcl, mcl, meniscus...and during my rehabilitation I started going back to Christian again and he is super knowledgeable and it helped a tremendous amount. I had experienced a shoulder injury and I was just in a lot of pain... Christian did one adjustment and then he gave me a series of exercises to do. Within 3 days all pain was completely gone and I got all mobility back and it was truly a miracle. My husband had chronic back pain...after 3 sessions he was miraculously free of the chronic pain. There was no soreness afterwards, it automatically just took care of itself. At this age this is just what we needed and we can not thank Christian enough. I ended up with some knee problems a year ago, I'm 66...I'm a long distance runner, I mean long distance, ultra marathon runner and I ended up getting hooked up with Christian, and he has made all the difference in the world. When I first got in here I could hardly run 3 miles without having severe pain and I'm back almost to my old form again so again a big should out to Christian. He has really done some great therapeutic work for me and if you have got a problem I would highly recommend Christian. The story is that he fixed my injuries and I sit here today just feeling great...and so if I have an injury I'm going to come back to Christian. I'm an MD and I'm glad to give this endorsement of Christian Leeby, a great teacher and great therapist who's helped me as well as my patients, hugely, over the years. I was having difficulty walking 2 to 3 blocks and I was sort of stooped over and I'm now able to walk 1 to 3 miles with my wife and our dogs every morning and that's been a real blessing and almost a miracle. Of all of the things that I've been using to treat my condition I'd say that what Christian has done for me had the most positive and lasting effect. The result is that you're going to feel better faster, and it's going to last longer and you will feel as good or better, with better posture, than probably you could ever imagine or even what your doctors might tell you.